Like many, I scroll through Pinterest every school night to decompress. One night I thought to myself, “if I love Pinterest, surely my students would love it too”. But how can they use it to learn? Here are some teaching ideas for you to try with your kids! You can do it 2 ways, have just one class account or have an account for each student and have the students “follow” each other. Of course make sure you have parents’ permission. Feel free to check out our class Pinterest account! Please read the very bottom note for more information. I start with pinning my own word problems on Pinterest either by taking a photo of a sticky note or exporting it from a powerpoint/keynote slide. 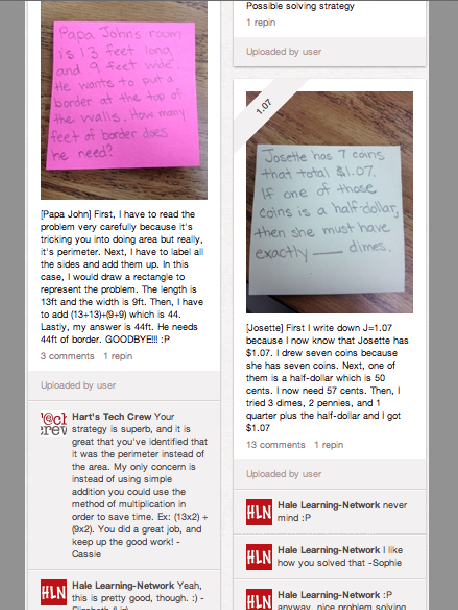 On the class account, students then type their strategies for solving a math problem in the comments. Slowly, students realize there are multiple ways to solve one problem AND they learn how to explain their thinking. For student accounts, students repin the word problem onto their own boards and type their thinking process and solution in the caption. As they get comfortable, have student develop their own word problems and pin them for others to solve. Better yet, connect with another class from your school or from another state. Make learning border-less. Maybe your students are working on character relationships, character traits or overarching theme. 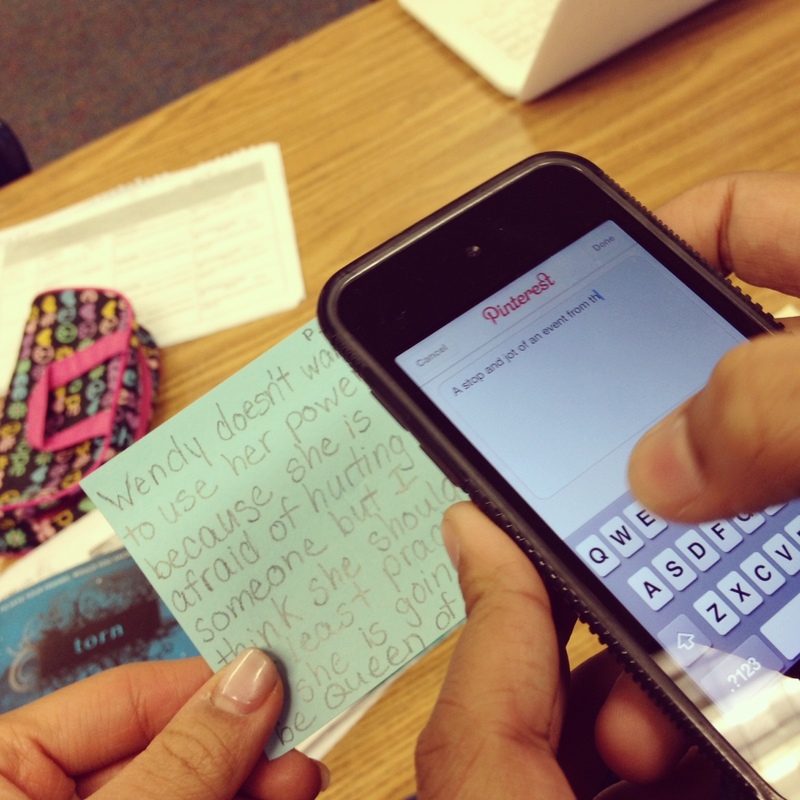 Or maybe your students are learning to summarize. Whatever it may be, have them write and share book reviews on Pinterest. My students learn far more from interacting and modeling after their peers than listening to me talk. Students just have find a book through Barnes & Noble or Scholastic, pin it, and then write a book review in the caption. Another option is to make a powerpoint/keynote slide of the book image along with a book review. Export it to Pinterest as a jpg. file and voila! Published. What now? Students’ book reviews are public now which means if they are following each other, their book reviews will pop up on their news feeds. My students would scroll through the book pins and repin the books onto 2 different boards: “Books I want to read” or “Books I’ve read”. Next time they wanted to check out a book or recommend a book, they simply referred to their Pinterest boards. In my reading workshop, we stress the value of thinking while we’re reading. As we read, we “stop and jot” our predictions, wonderings, feelings, etc on sticky notes. In our workshop, we also learn that our reading responses exist on a continuum with many different levels of responses. My students like to pin their stop and jots on Pinterest and the students can give feedback to one another on what they liked and how the reader can think deeper. This is also extremely powerful if you pair up with a class from a different grade level. For example, my fifth graders paired up with third graders and helped them to grow in their predictions. This is one idea I plan to explore more this year. My teacher friend, Paige, out in California played with this idea last year and I love it! The idea is to create boards such as “strong leads”, “showing not telling”, or “similes/metaphors”. Students would either create examples on Keynote/powerpoint slides to pin to the boards or would take photos of good examples found in our own writing. This would be great to collaborate with students in other classes or schools. Perhaps my students will recognize these as universal writing skills and become motivated to apply it to their own writing. I teach with a lot of anchor charts in both math, reading, and writing. However, students only refer to them if they are less than afoot away from them. We also don’t have enough wall space to keep the charts on the walls all year and students definitely can’t refer to the charts when they are at home doing homework. 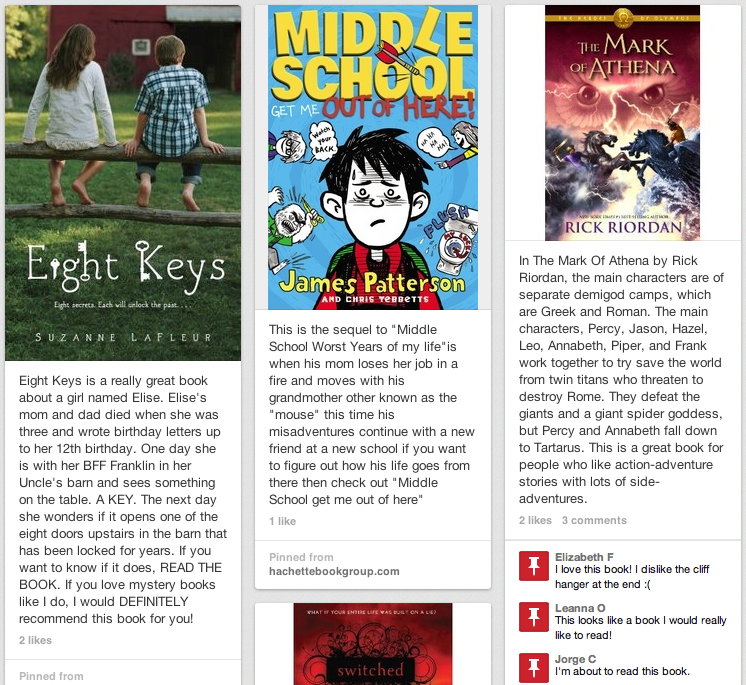 I’ve found that pinning them on Pinterest and organizing them into boards have been very helpful for my students. They repin them to their own boards and can access them whenever and wherever. 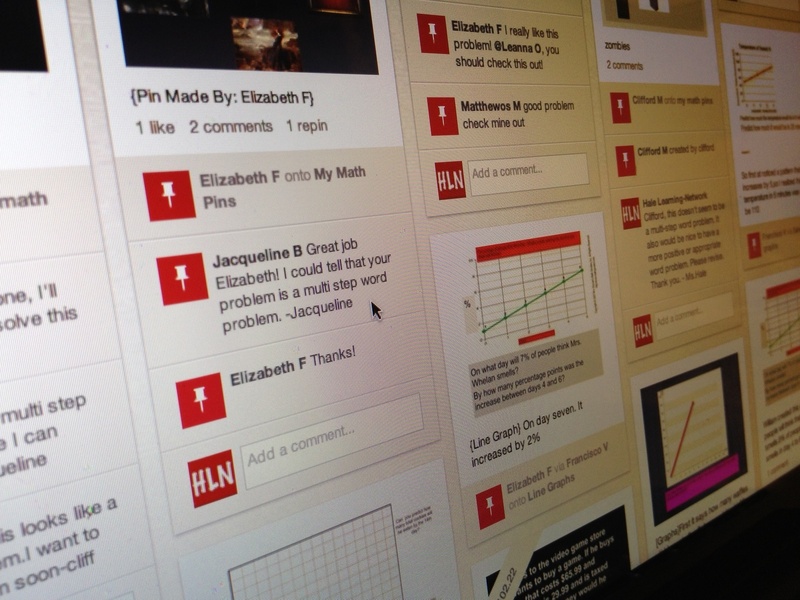 Pinterest can be difficult to filter and control for classroom purposes. Recently, Pinterest has decided to “recommend” pins to our accounts so our news feeds are no longer filtered. You also run the risk of a student searching for your personal Pinterest account. As of right now, you cannot privatize your Pinterest profiles. Because of this, I am currently trying out a site I developed through Socialengine that centers on visual-media sharing similar to Pinterest. It is only for students and teachers and you have to request an invite to join. It also has a few features that are learning-friendly. I will update you in the next couple of months!!! For now, feel free to check it out at mylockers.socialengine.com! ← So You Think You Can’t Dance?